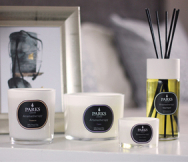 Each of our ‘tot’ Natures Own candles are hand crafted by our expert team of candle creators. They start with some of the finest waxes available to create a burning medium that produces virtually no smoke, soot or inadvertent odour. To each batch is added a single scent, which is created by mixing 100% pure essential oils, botanical aromatics and/or premium exotic resins before being gently folded into the wax base. Finally, this mixture is poured by hand into a glass votive mini vase, around one of our top-quality smoke-free wicks.